Pinot Bianco is one of Italy’s best-kept secrets. Its close relative, Pinot Grigio, grabs all the attention and Pinot Bianco remains out of the limelight but the smart money knows to go looking for it. In fact, Italy is one of the best sources for Pinot Bianco wines anywhere in the world. Only parts of Austria and Germany make world class Pinot Bianco (Weissburgunder) wines comparable to those of the boot. Do not make the common mistake of thinking that Alsace makes great Pinot Bianco wines too: for the most part, it does not. This is because the vast majority of wines labeled Pinot Blanc (the French version of Pinot Bianco, but the two are one and the same) are in fact not made with Pinot Bianco at all but with Auxerrois, another grape variety altogether. In fact, Pinot Blancs from Alsace are either blends of the two grapes (Auxerrois almost always dominates the blend roughly by an 80-20 margin) or even 100% Auxerrois (100% Pinot Blanc wines are extremely rare there and few are noteworthy). Believe it or not, that’s not the only weird thing in the world of the Pinots. I did not use the words “close relative” in referring to Pinot Grigio and Pinot Bianco at the beginning of this article by chance. Although I am starting to feel like someone working for Ripley’s, believe it or not (again) current scientific knowledge tells us that those two grapes are genetically identical. Wait, it gets better. Research also tells us that Pinot Nero (or Pinot Noir), is also identical to Pinot Bianco and Pinot Grigio. Clearly, that is not so, as there are obvious differences between those three grapes and their wines. This conundrum is the result of current genetic knowledge that does not allow us to discern differences that exist between the three genomes or that the genomes of the three varieties are made to work differently (just because the DNA looks alike does not mean it is made to work the same way). These observations have far reaching implications for many other varieties too, for example Italy’s Vermentino, Pigato and Favorita, also said to be genetically identical when the grapes don’t look anything alike and the wines don’t resemble each other much either. In any case, unlike Pinot Grigio, which has a reddish-rusty skin color and can be made in a style that brings out that pigment, Pinot Bianco yields only white wines. Pinot Biancos are characterized by delicate aromas and flavors of white flowers, pomaceous orchard fruit, chamomile and beeswax. There is also a certain mellowness of flavor that is very typical of Pinot Biancos, especially when they are made from ripe grapes with healthy sugars. Pinot Biancos are never characterized by nostril-piercing or palate-burning levels of fruit intensity or acidity; rather they are all about refinement and balance (the good ones, at least). Some consumers prefer Pinot Grigio’s more obvious size and flavors, and pass Pinot Bianco by. However, only rarely does Pinot Grigio reach the levels of refinement that Pinot Bianco is capable of. The Nals-Margreid (Nalles-Magrè in Italian) cooperative of today was originally founded in 1932 by forty-five original members as the Kellerei Nals (Cantina Nalles, in Italian). 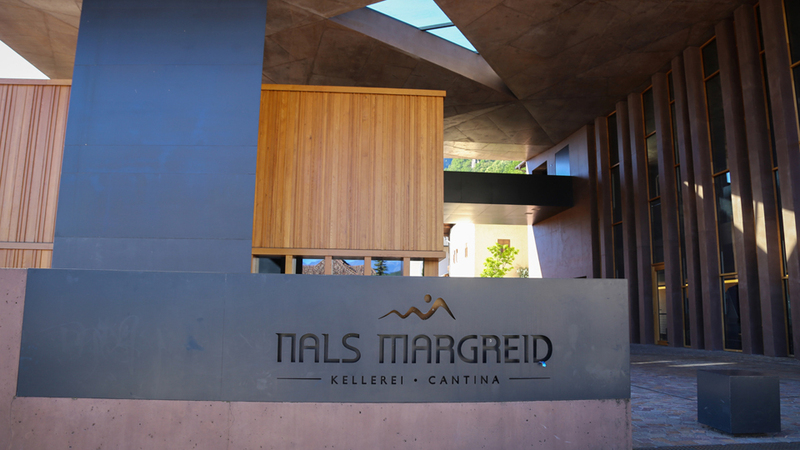 In 1985 Kellerei Nals merged with the Margreid-Entiklar coop (founded in 1954) and took the new name of Nals-Margreid-Entiklar, or Nalless-Magrè-Niclara (the Entiklar/Niclara was dropped in the mid 2000s in order to have a more manageable company name). 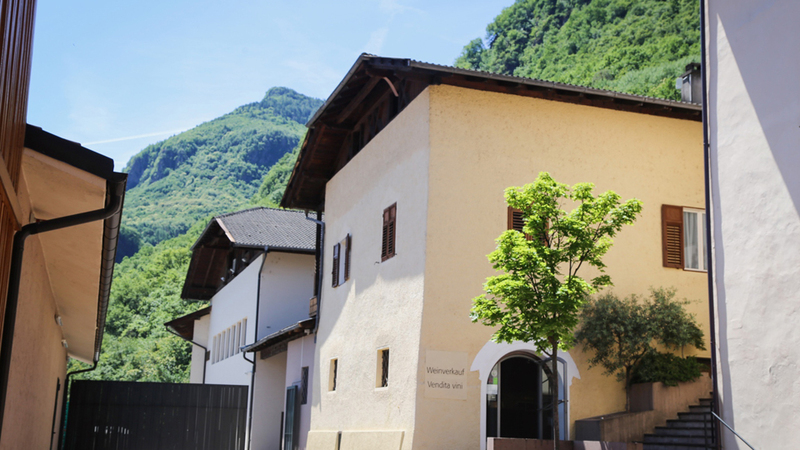 Today the coop is located in the town of Nalles and oversees the work of 138 members who farm 170 hectares in 14 different areas within Alto Adige. To put Alto Adige’s viticulture into perspective, consider that the region has 5,300 hectares and about 5,000 wine producers, which translates into the smallest average ownership of land per producer in Italy by a wide margin. The most important areas in Alto Adige where Nals-Margreid sources grapes are Nalles, Sirmian, Magré and Bolzano. 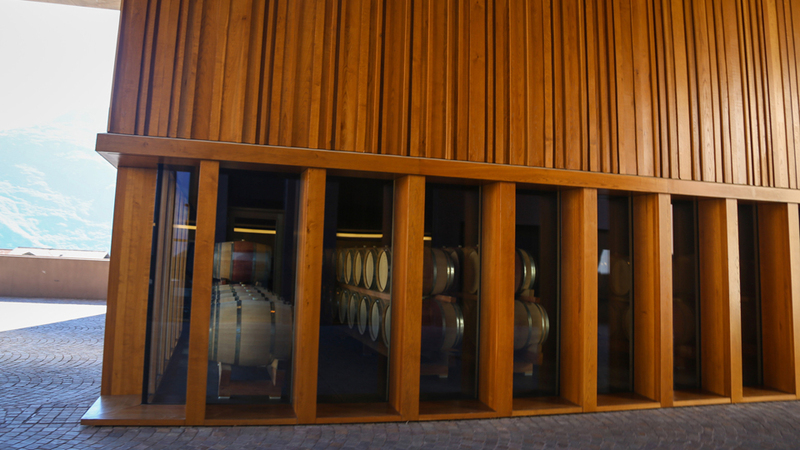 The coop added a new, modernist-looking winery building extension in 2011, with a spacious, truly beautiful terrace that offers gorgeous views of the surrounding mountains. In 2007, the nearby (small) Schwanburg coop closed up shop because of the death of its main owner, and so Nals-Margrei stepped in to give a hand. In taking over responsibility of Schwanburg’s vines, wines and the well being of its members and their families, the cooperative added another fifteen hectares under vine and four new members. I would have to say the Schwanburg members have fallen into very good hands. One of the strongest suits of Nals-Margreid is the team at its helm, from president Walter Schwarz, the talented and young winemaker Harald Schraffl and the ultra capable and extremely hard working general director, Gottfried Pollinger who is very much the face of the cooperative that tirelessly travels around the globe promoting it and its wines. Another important reason why the Sirmian gets right of way is to be found in its name. Sirmian is the name of the wine but also that of the area where the Pinot Bianco used to make this wine grows. Is this important, you ask? Very. Sirmian is located within the Terlano subzone of Alto Adige, where Italy’s best Pinot Bianco wines are made. Only Friuli Venezia Giulia’s producers of the Collio might be able to argue that statement. It is where the Terlano coop makes their famous Pinot Bianco Vorberg Riserva wine, Italy’s most age-worthy white wine (see the Terlano Vorberg vertical in the Vinous database. Interestingly, Nals-Margreid makes another Pinot Bianco wine called Penon from grapes grown down by the town of Magrè, in the area of Penon which takes its name from Penone, a fraction of the town of Cortaccia. It could not be anymore different than the wine made with Sirmian grapes. The differences are due to the combination of soil, topographical and winemaking diversity. Penon is situated just above the town of Cortaccia in the Bassa Altesina area of Alto Adige at about 600 meters above sea level in a fairly flatland setting (or at hillsides with at most a 20% gradient) and very calcareous soils. Pinot Bianco there tends to give wines that are elegant, but also very fruity. By contrast, Sirmian is located close to the town of Nalles and boasts soils characterized by morainic debris and porphyr bedrock plus gneiss, mica, and marble inclusions and very steep slopes ranging from 550-680 meters above sea level. Over the years, Sirmian’s Pinot Bianco vines have been partially replanted and so vines there average only about thirteen years of age. The Pinot Bianco Sirmian was first produced in 1971. Grape bunches used to make Sirmian are cut in half the week before color change (véraison; in the Nals area this usually happens around mid-July). It is also important to know that in some years grapes are attacked by noble rot, as the Sirmian grapes are always harvested on the later side, weather permitting. Sooner or later noble rot hits the Pinot Bianco. And despite not using any grapes affected by Botrytis cinerea to make Sirmian), removing noble rot influence is extremely hard to do because rot is not always fully visible. Therefore, in some vintages, the Pinot Bianco Sirmian can be marked by a slight, but very recognizable, touch of noble rot (such as was the case in 2013 and 1998). Normally, I am a huge proponent of a touch of noble rot in dry and especially so in sweet wines. I believe that, when present, noble rot takes many such wines to a whole different level of texture and complexity, but I absolutely get Pollinger’s point as it does not seem like, at least in Sirmian’ case, Botrytis cinerea adds that much extra. In any case, Sirmian is always very complex and mineral, and can be very shut down when young. The Sirmian undergoes 100% malolactic and is now aged in 20-30 HL barrels, whereas up until the end of the 1990s it was partly aged in stainless steel tanks. In my view, the best vintages are 2012 and the 1986, but the 2016 may well join those ranks. Older vintages were labeled with the Germanic “Weissburgunder” instead of the Italian “Pinot Bianco” name. 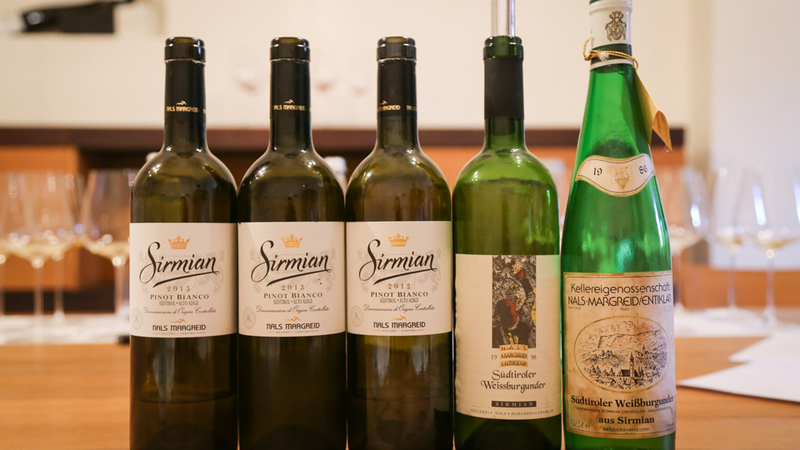 All the following wines (save for the 2009 and 2008 that I bought on release and that therefore came from my own cellar) were sourced directly at the winery and tasted there with Harald Schraffl and Gottfried Pollinger in October 2017.